October is a tough month for cycling in the Midwest, specifically for finding openings in the rain that correspond to openings in the schedule. Today presented a forecast of rain throughout the day, but there appeared to be a tiny opening between weather systems on the radar. I decided to take that opening, and rushed out to get on the trike. My Columbia nylon "noisy pants" are not nearly as water resistant as I thought they would be. I do not own any actual rain gear. Fenders might be a more worthwhile accessory that I had originally thought. A break in weather systems on the radar does not necessarily equal a complete break in the rain. It’s the last item that ended the experiment. I turned tail and went home. I had originally planned on a short ride - about 7 miles - that I knew would turn me around quickly, but I bailed a little over two miles in. Still - getting some time on the road - wet or not - is better than getting none at all. I knew when I got my Catrike Pocket I'd need to devise a setup to mount and charge my iPhone. For the phone mounting purposes I used a Rokform Pro Series iPhone Bike Mount. I have used Rokform cases to protect my phones from myself back to my iPhone 5 days. The cases offer a mechanical mounting system and a magnetic mounting system, and uses the two in combination for the bike mounting system to make your phone extra secure[^1]. As I've mentioned here before, when I go out riding my iPhone gets heavy use. I use Cyclemeter to track my speed, distance, and route, and that involves having the screen lit throughout the ride so I can get the feedback from the app. I'm also typically playing either an podcast or an audiobook to headphones over Bluetooth. These are battery intensive tasks and, especially on longer rides, even a fully-charged, plus-sized iPhone may run low. Since the phone is also my lifeline if I run into trouble, I need it to remain functional throughout the ride. This means I need a way to charge the phone during the ride. 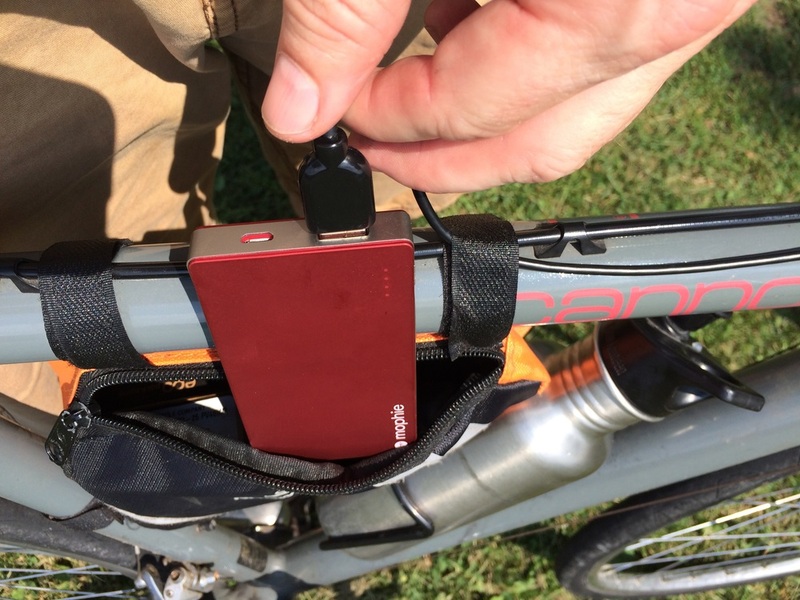 On my Cannondale I put together a fairly basic setup using a USB cable and a Mophie Powerstation dropped into the bike's frame bag. This worked well enough, and I've used a variation of that setup for a little while on the Catrike, with a battery pack in one of the saddlebags. But I wanted to improve on this arrangement. Last fall I picked up a battery with a solar panel. While it takes some time to fully charge using the solar panel alone, once it has an initial charge the solar panel can defray the power loss and extend the length of a charge. I have a rear rack on the Catrike, so it wasn't much of a leap to put the battery out in the sun on the rack. I originally tried strapping the battery to the rack using elastic straps. Unfortunately the straps blocked some of the solar panel and, worse than that, rattled like crazy on the aluminum rack. My solution for this was Velcro. Specifically, getting a roll of Velcro with an adhesive back and set the soft side on the rack. To connect it all I ran a 10 foot braided nylon lightening cable up through the seat and attached it to the frame at either end using Velcro wrap thin ties[^2]. 10' is longer than I need for this application, but I like having the extra, so I have the extra coiled up in the saddlebag. The result of this? After getting everything set up I took my Sunday ride. I was out for a little over an hour. I ran the screen the entire time, bright enough to see it in full sunlight, using Cyclemeter (which runs the gps), and listened to an audiobook. I stopped a couple of times to take pictures along the way as well. When I arrived at the end of the ride the phone battery was at 100%, and the battery pack on the back of the trike was at 75%. This suggests I probably could have ridden another three hours before I put a dent in the charge on the phone itself. The Velcro attachment worked a treat - my ride was 14+ miles, and included some gravel. I heard no rattling, and came home with the battery firmly attached. Because of where the phone sits, my right leg hides the bottom part of the screen at times when I'm riding. Still, while it's close I don't actually hit the phone, and Utah Trikes seems to make additional attachments that I could consider for mounting the phone down the road. For the moment, it appears to work well enough. Until and unless I start on much longer rides, I think this will work well. And, as far as that goes, there is room on the rack for at least one more battery. All in all, I'm pretty happy with this arrangement. [^1]: I've used a variation of this on my Cannondale - the bike mounts are built to work with the top cap of a 1/8" threadless tube, which is common on modern bikes, but predates my vintage Cannondale, so there I used the Rokform motorcycle mount attached to the handlebar. The motorcycle mount is more expensive, though, so I was pleased that the 1/8" threadless mount worked for the Catrike. [^2]: These are sort of like reusable Velcro tie wraps. They come in rolls of 25 wraps, and once you have them you'll find dozens of uses for them around the house. They are pretty awesome. The Mophie Powerstation fits nicely in my frame bag. In an unusual twist the weather today - November 1 - turned out to be perfect for riding. When I go out for rides I use my iPhone to track my distance, speed, etc, using an app called Cyclemeter. I also use it, paired with my Jumbl Bluetooth Audio Receiver, to listen to audiobooks and podcasts while I'm riding[^1]. The difficulty is that, on longer rides, the battery on the iPhone may have trouble keeping up. It's not really the phone's fault - it's being asked to do a lot: run the the GPS radio continuously, keep the screen lit, and transmit audio over Bluetooth. For rides that run longer than an hour it's hit or miss as to whether the phone will last the entire ride. I can lengthen this by turning off the screen, which can help quite a bit, but I enjoy the feedback the app gives. It occurred to me a while back that I could take a battery pack and attach that to the phone while I was riding. They do make products to do this - for example, this gizmo that uses the power from your pedaling to provide a charge. But that type of thing seemed fiddly and expensive, and a simple battery pack like the ones made by Mophie would also have uses in settings besides riding. So that's what I did. I purchased a Mophie Powerstation and set it up to sit in my frame bag, with a lightening cable connecting it to the iPhone, secured to the frame using a Velcro cable strap. I've been using it for the past two or three months, and it works like a charm. I have enough power to get through the ride without worrying about my charge, with a minimum of fuss. [^1]: The entertainment for today's ride was the 10/29/15 episode of NPR's Ask Me Another featuring Bruce Campbell and Lucy Lawless. I always enjoy this show, but it was exceptionally good this time - both Bruce (from the Evil Dead movie franchise and Burn Notice, as well as the short lived, and truly awful Brisco Country Junior) and Lucy (Xena: Warrior Princess and Battlestar Galactica) were some of the funniest guests I've ever heard on the show.